Workplaces often require movable surfaces for bringing productivity anywhere. These computer workstation carts are ideal for holding desktop PCs, laptops and printers in any occupation. Each stand has shelves, compartments and equipment holders for accommodating a variety of tools, machines and accessories. 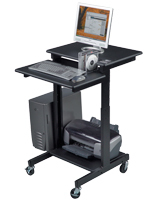 Offices, hospitals, warehouses and veterinary clinics make use of these ergonomic computer workstation carts, or mobile work desks, with their convenient portable design. 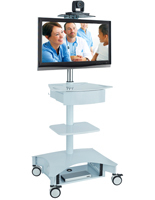 Nurses’ stations can utilize the height adjustable fixtures to keep records at hand and make information readily available. 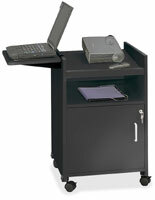 Schools and colleges will save room with these computer workstation carts that are easily be moved out of the way. 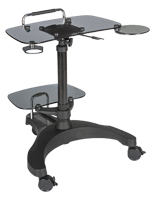 Take these worktables with caster wheels anywhere. What makes these mobile work desks excellent for businesses, service organizations and more? 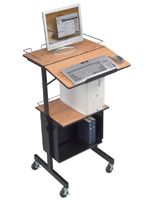 Each of the computer workstation carts has a height adjustable design for accommodating any user. While not all of the units here have a changeable size, they at least include alterable shelves for keeping accessories wherever they're needed. This line is made from durable materials like ABS plastic, steel and polypropylene in neutral finishes such as gray, black and silver. Their neutral appearance will fit in at any store, healthcare center or university. 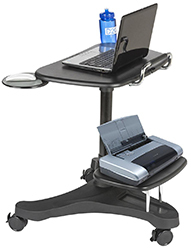 Another great feature of the mobile work desks is their ergonomic design that's made for use with comfort. 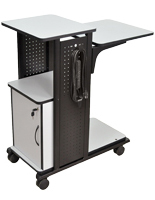 This line of workstation carts comes with trays for laptops, keyboards and mice for more natural positions when working. 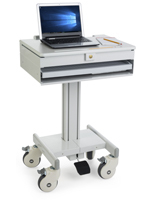 The mobile work desks use locking caster wheels for mobility and can be moved from room to room with ease. With their lockable rollers, they add stability in busy hospitals, crowded offices and areas with uneven flooring. 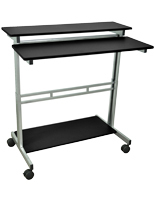 Some workstation carts with shelves also come with monitor mounts for directly holding screens. 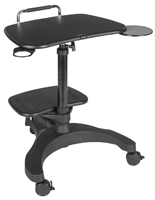 This saves desktop space and allows for better neck and back posture with their ergonomic shape. Simply move these brackets to better accommodate students and employees. 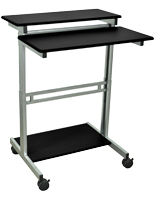 The carts come with different shelf layouts for holding a variety of PC setups and occupational materials. This type of fixture supports a number of displays, printers, notebooks, writing utensils, projectors and CPUs while retaining mobility. In addition, some models include extra compartments for even more utilities. 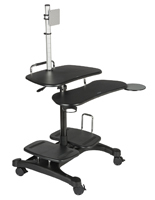 What other features do these ergonomic carts for vets, doctors and professors include? Some stands feature up to two screens on brackets. 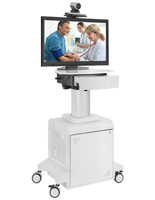 This is ideal for medical centers and hospitals where multiple devices are required to get the job done. 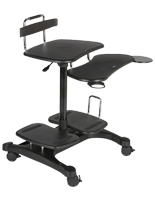 Another perk found on many height adjustable models is the ability to switch between sitting and standing positions for extra versatility and promoting better posture. 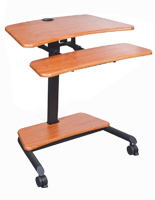 Desks with caster wheels can also include locking compartments and drawers for storing valuable supplies out of sight. Order from Podiums2go.com for quick shipping.